(Nanowerk News) JILA researchers have designed a microscope instrument so stable that it can accurately measure the 3D movement of individual molecules over many hours—hundreds of times longer than the current limit measured in seconds ("Ultrastable measurement platform: sub-nm drift over hours in 3D at room temperature"). The technology was designed to track the machinery of biological cells, down to the tiniest bits of DNA, a single "base pair" of nucleotides among the 3 billion of these chemical units in human genes. But the instrument could be useful well beyond biology, biochemistry and biophysics, perhaps in manufacturing. JILA, formerly known as the Joint Institute for Laboratory Astrophysics, is a partnership of the National Institute of Standards and Technology (NIST) and the University of Colorado Boulder. "This technology can actively stabilize two items relative to each other with a precision well below one nanometer at room temperature," JILA/NIST physicist Tom Perkins says. "This level of 3D stability may start to interest the nanomanufacturing world, when they look at making and characterizing things on the single-nanometer scale." The work builds on JILA's world-leading expertise in measuring positions of microscopic objects. The latest tweaks extend stability for a much longer time period, many hours at a time. With the longer observation times, researchers can see more successive steps of molecular motors, for instance. These biochemical processes are responsible for a broad range of movement in living organisms, including moving molecules around the interior of a cell or copying DNA into another form of genetic material, RNA. The new JILA instrument also can aid in measuring individual proteins as they fold into specific positions, a process required for them to work properly. Until now, researchers had difficulty detecting more than a few individual, one-base-pair steps in succession before instrumental "drift" would blur the signal. Observing such sets of repetitive steps is very rare. The instrument must be stable to within about one-tenth of a nanometer (1 angstrom to biologists, equivalent to the diameter of a hydrogen atom). Typically, a microscope can only occasionally achieve this level of stability. But when augmented by the new JILA measurement platform, it can reliably achieve tenth of a nanometer stability for up to 100 seconds at a time. And it can do this over and over again for extended periods—the JILA team operated the system for up to 28 hours straight. In addition to its high precision and stability, the instrument can detect motion over a wide range of time scales, critical for calibrating instruments and measuring short-lived states in protein folding. The JILA method can be applied to optical trapping techniques, atomic force microscopes and super-resolution imaging. 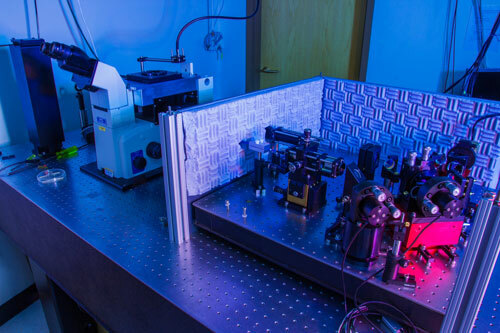 The method uses two lasers to measure the positions of opposite ends of a molecule, or two different objects, based on the intensity of scattered light. The scattered light is detected by a common photodiode, and the signals are digitized, analyzed and used to calculate the positions of the samples. Crucially, the JILA team verified the stability of the technique by using the two lasers to make two separate, independent measurements of a single sample. Without this confirmation, researchers can't determine if it is the sample or the lasers moving, Perkins explains. "This technology excites me because it opens the door to measuring the tiniest protein motions," Perkins says."